The operation consists of removing a major part of the stomach leaving behind a gastric tube with reduced capacity. The course of the food is not altered but the eating capacity is seriously restricted. The term "sleeve" refers to the reduced stomach taking on the shape of a sleeve. This operation is only restrictive and suitable for big eaters (sportsmen or heavy labourers) whose increasing weight is in accordance with a reduction of physical activity. It is not suitable for grazing eaters and sweet eaters. 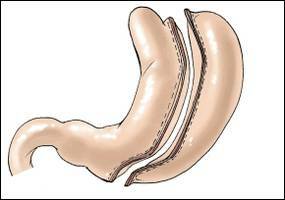 If a duodenal switch is required to be done in two separate steps, this can be applied as a first phase. It is not suitable for a BMI higher than 50, or for patients with a hiatal hernia.